Street Fighter (?????????? Sutorîto Faitâ?) is a 1987 arcade game developed by Capcom. It is the first competitive fighting game produced by the company and the inaugural game in the Street Fighter series. While it did not achieve the same popularity as its sequels (particularly Street Fighter II) when it was originally released, the original Street Fighter introduced some of the conventions made standard in later games, such as six attack buttons (only found on some versions of the game) and special command based techniques. 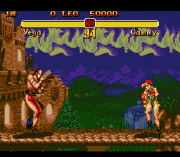 The game begins with the player being prompted to choose one of two destinations (or four, depending on the dip switch settings) as the setting of their first fight. There are four countries to choose from: the US, Japan, England and China. Once a country has been selected, the player must fight against the nation's two fighters in best two-out-of-three matches. Once the player has defeated both of the nation's fighters, they must go through a bonus round before proceeding to the next destination. Once all four countries have been cleared, the player character travels to Thailand for the last two opponents in the game. 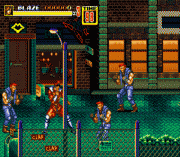 There are two types of bonus rounds in the game: one in which the player must break wooden boards held by three or four men (depending on the progress) and another in which the player character must break a set of stacked roof tiles with proper timing. Characters The original Street Fighter features a cast of twelve fighters: two playable characters and ten CPU-controlled opponents. Of these characters, only Ryu, Ken and final boss Sagat would return in the game's immediate sequel Street Fighter II, although characters like Birdie, Adon and Gen would resurface in the Street Fighter Alpha series. Unlike the subsequent Street Fighter games, the player cannot choose his or her own character. Instead, the first player is assigned to play as Ryu, while a second player can join in and play as Ken in competitive matches. The player can perform all three of Ryu and Ken's signature special moves, but they are very difficult to do due to the game's relative primitive controls (in comparison to later titles). Due to the unbalanced nature of gameplay, doing 1 or 3 of these moves could easily defeat an opponent in a matter of seconds. Ryu - The main character. A Japanese warrior entering the tournament to test his strength. Ken - Ryu's former sparring partner and rival. Ken appears primarily in competitive matches, as he is controlled only by the second player. Retsu - A master of Shorinji Kempo who fights in front of a temple. While the character never appeared in another Street Fighter game, he still forms part of the later games' backstories (being established as a friend of Ryu and Ken's teacher, Gouken). Geki - A claw-wielding ninja who also uses shurikens and teleportation techniques. Joe - A blonde-haired American kickboxer who fights in a train station. He is seen in the opening movie in Street Fighter II. Mike - An African American heavyweight boxer who fights in front of Mt. Rushmore. The character of Balrog from the later games is often considered to be an evolution of Mike, as Balrog's original Japanese name is M. Bison or Mike Bison in full. He is seen the opening movie in Street Fighter II being punched by Joe. Lee - A Chinese martial artist. The twins Yun and Yang from Street Fighter III are his nephews. Gen - A Chinese assassin. Reintroduced in Street Fighter Alpha 2. Birdie - A tall British punk. He reappeared in the Street Fighter Alpha series with a radically different character design. Eagle - An English gentleman who wields twin kali sticks. He did not appear in another game until Capcom vs. SNK 2. Adon - A Muay Thai fighter and student of Sagat. Reintroduced in the Street Fighter Alpha series. Sagat - The final opponent in the game. A Muay Thai expert who holds the title of "King of Street Fighters." He would return in Street Fighter II, bearing a scar on his chest and a grudge against Ryu.